When it comes to finding the right compact sedan, there are a number of attractive options on the road. Drivers can have a dizzying set of choices when it comes to price, fuel-economy, interior space, technology, and even warranty information! Fortunately, the all-new 2019 VW Jetta is hitting all the right notes. In this 2019 Volkswagen Jetta vs 2019 Toyota Corolla comparison, the Volkswagen compact sedan excels in multiple practical areas. To start, the 2019 Volkswagen Jetta has a slightly lower starting price than its Toyota rival, which just sweetens the pot on its other advantageous features. It also delivers more cargo space, thanks to 14 cubic feet of cargo space in the trunk, compared to just 13 cubic feet on the 2019 Toyota Corolla sedan. This means that car shoppers can get more hauling ability for the money. We also love the peace of mind that comes standard on the 2019 Volkswagen Jetta here in Daphne AL thanks to the Volkswagen People First Warranty. While the 2019 Volkswagen Jetta offers plenty of engaging and intriguing new features, this compact sedan also excels at the basics. Its standard 1.4-liter four-cylinder engine offers 147 horsepower and 184 pound-feet of torque, which handily beats the 132 horsepower and 128 pound-feet of torque that is available with the 1.8-liter engine of the 2019 Toyota Corolla. A savvy car shopper, seeing the difference between these numbers might think that the 2019 Jetta would pay for that excellent engine output with lower fuel efficiency, but this model also delivers the good when it comes to fuel-sipping sensibilities. In this 2019 Volkswagen Jetta vs 2019 Toyota Corolla comparison the Volkswagen model can offer up to 30 mpg in city driving and 40 mpg on the highway. In contrast, the standard 2019 Corolla four-cylinder offers just 28 mpg in city driving and 36 mpg on the highway. Would you like to learn more about the all-new 2019 Volkswagen Jetta in Daphne AL? 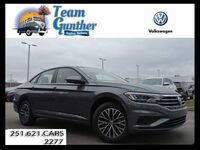 Contact a dealership representative at Team Gunther Volkswagen today to learn more about what this model has to offer, and the special incentives that may be available for you today.